Add rice, salt and water in a pot and bring to boil. (How to cook rice). Add broad beans to the boiling pot of rice about 1 to 2 minutes before draining. Drain the rice then gently mix in the chopped dill. In a pot, add oil, 3 tablespoons water and a few drops of liquid saffron. Place the rice into the pot and gather to the center of the pot. Make a few holes on the rice pile and sprinkle with cinnamon. Cover the pot and heat until the rice starts to steam. Cover the lid with a kitchen towel, cover the pot and cook the rice for 45 minutes on a lower heat. Prepare the saffron topping, by mixing a cup of rice with saffron liquid. 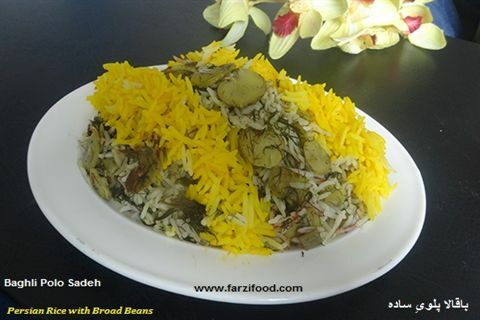 Arrange the rice in a serving dish, decorate with saffron topping and serve hot top with clarified butter. You can serve this food with yoghurt and pickles of your choice. If you want to get a good tadig, (crunchy rice) cook rice for 1 Hour. If you don’t have access to fresh dill, use the dry one. You can always freeze this food for later use. Remember to keep constant watch during cooking to avoid a fire. When you make chicken kebab, don’t overcook the chicken as it’ll become too dry.